Dating to the 1930s, this English trio is very pretty indeed. It is the Johnson Bros pottery, who were famous for their pretty and practical utilitarian pottery tableware. This trio is from their Pareek pattern range, which is one of their most widely collected and eye catching styles. 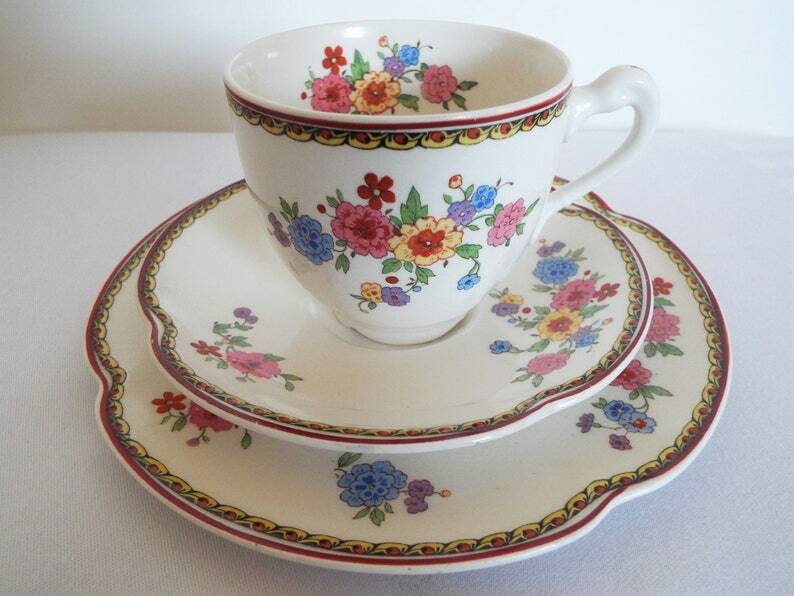 The elegant transfer pattern of brightly coloured flowers on a pale yellowy-cream background is on all the elements of this trio and is also repeated inside the teacup, which is a lovely touch. The rims have a very stylish repeating pattern in yellow, orange and black. This tea set trio really stand outs, whether on the tea table or on display. It is definitely a very stylish trio that is perfect if you love the style of the1930s and is perfect if you have a home from this era, or if you wish to bring a touch of 1930s style to your home! The pattern is perfect for a summer tea time or even tea in the garden! It would make a lovely gift to a tea lover or for a special occasion such as a birthday or baby shower. It would stand out at any prettily styled tea party. There is Johnson Bros maker's mark and Pareek pattern name printed underneath the tea plate and saucer. Underneath the teacup is impressed 'Johnson Bros England'. In very good vintage condition. There are no chips or cracks and the transfer pattern is in good and bright condition. There is crazing to the glaze of the tea plate, as can be seen in the photos. These are no cracks and crazing on pieces from this era is perfectly normal, due to the thick glazes used. This trio is in perfectly sound and usable condition. Any further wear or marks are commensurate with age. Your item will be prettily gift wrapped for free in vintage style brown paper and ribbon.